This second edition has been extensively revised and clarified, and the topics have been substantially rearranged. The book now introduces the two most important analytic tools, the rank theorem and the fundamental theorem on flows, much earlier so that they can be used throughout the book. A few new topics have been added, notably Sard's theorem and transversality, a proof that infinitesimal Lie group actions generate global group actions, a more thorough study of first-order partial differential equations, a brief treatment of degree theory for smooth maps between compact manifolds, and an introduction to contact structures. Illustrations note XVI, 708 p.
This book is an introductory graduate-level textbook on the theory of smooth manifolds. Its goal is to familiarize students with the tools they will need in order to use manifolds in mathematical or scientific research--smooth structures, tangent vectors and covectors, vector bundles, immersed and embedded submanifolds, tensors, differential forms, de Rham cohomology, vector fields, flows, foliations, Lie derivatives, Lie groups, Lie algebras, and more. The approach is as concrete as possible, with pictures and intuitive discussions of how one should think geometrically about the abstract concepts, while making full use of the powerful tools that modern mathematics has to offer. John M. Lee is Professor of Mathematics at the University of Washington in Seattle, where he regularly teaches graduate courses on the topology and geometry of manifolds. 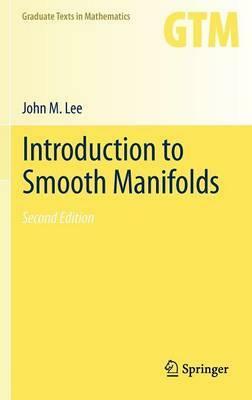 He was the recipient of the American Mathematical Society's Centennial Research Fellowship and he is the author of four previous Springer books: the first edition (2003) of Introduction to Smooth Manifolds, the first edition (2000) and second edition (2010) of Introduction to Topological Manifolds, and Riemannian Manifolds: An Introduction to Curvature (1997).